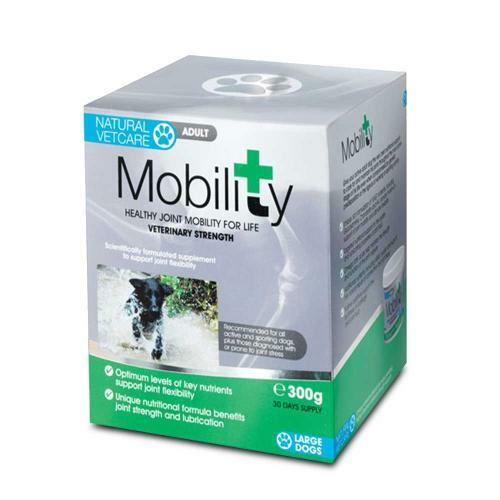 Providing the best nutritional support for active adult dogs the Mobility from Natural Vetcare keep them active and healthy. Recommended for active and sporting dogs as well as those diagnosed with or are prone to joint stress. Glucosamine, chondroitin and hyaluronic acid: support joint mobility and flexibly. Ingredients:Hydrolysed Poultry Protein, Methyl sulphonyl methane, Glucosamine, Wheat protein, Chondroitin sulphate, Salmon oil, Calcium carbonate, Linseed oil, Hyaluronic acid.